Received June 25, 2018; Revised August 14, 2018; Accepted August 25, 2018. The traumatic transection is located in the normal sized aortic isthmus where the angle is curved. We found a reversal of upper and lower blood pressure differences among patients who underwent thoracic endovascular aortic repair (TEVAR) for transection of the thoracic aorta. We investigated the isthmus stenosis in patients who underwent TEVAR for aortic injury using computed tomography. Sixteen patients who underwent TEVAR for transection were divided in two groups: the aortic narrowing (AN) group and the non-aortic narrowing (NAN) group. AN was defined as stent graft folding more than 5 mm at the isthmus confirmed by computed tomography. The length of aorta at isthmus, pseudoaneurysm, and angle of isthmus were measured. AN was noted in five patients (31.3%). The area index in the NAN group (2.16±0.35 cm2/m2) was larger than that in the AN group (1.74±0.77 cm2/m2). The size of the pseudoaneurysm in the NAN group (31.9±4.2 mm) was smaller than that in the AN group (37.4±7.5 mm). The distance from the subclavian artery in the NAN group (15.7±9.3 mm) was longer than that in the AN group (8.4±3.2 mm) but not statistically significant. The angle of the isthmus in the NAN group (131±6 degrees) was larger than that in the AN group (107±3 degrees), and this was the only statistically significant difference (P=0.002). AN by stent graft folding should be considered when performing TE-VAR in aortic injury with an acute angle of the isthmus less than 110 degrees. Traumatic transection of the thoracic aorta (TTA) is a life-threating emergency in blunt thoracic injury and is the second most common cause of death after head trauma . TTA is associated with accidents that involve sudden deceleration, such as that experienced in a car crash, and usually occurs at the aortic isthmus . The bidirectional force impacts on the aortic isthmus where the fixed aortic arch connects to the relatively mobile descending thoracic aorta. An article in 1958 by Parmley et al. reported an 85% pre-hospital mortality in patients with TTA. Traditional open repair was standard treatment, but a 20-year meta-analysis published in 1994 reported a mortality and paraplegia rate of 32% and 9.9% respectively . Patients with TTA often have accompanying multiple organ damage, which puts them at high risk for an open thoracotomy procedure, single lung ventilation, heparinization, aortic clamping, and multiple transfusions. Recently developed thoracic endovascular aortic repair (TEVAR) has advantages compared to open surgery for management of TTA [1–4]. TEVAR was originally developed to treat thoracic aortic aneurysms, but with advances in stent graft material and technique, it has now been modified to treat TTA . The aortic diameter is generally the most important anatomical consideration when performing aortic stent grafting . Patients undergoing TTA are typically young, and their aortas are usually small, unlike those encountered in patients with aortic aneurysmal changes. Most stent grafts for TEVAR were developed for aortic aneurysms, and their wire design was not developed for a small aorta or for the aortic isthmus. The aortic isthmus is anatomically located between the origin of the left subclavian artery (LSA) and the aortic end of the ductus arteriosus . Most TTA lesions are located within a few centimeters of the aortic isthmus. Each individual has a unique aortic isthmus anatomy. We found a reversal of upper and lower blood pressure differences among patients who underwent TEVAR for TTA. We observed the status of the aortic isthmus based on computed tomography (CT) images of all patients who underwent TEVAR in Inha University Hospital with TTA. The parameters affecting aortic isthmus narrowing were also analyzed. In this paper, we investigate the frequency of aortic narrowing (AN) after TEVAR in patients with TTA, and discuss the causes and clinical features. The 16 patients were divided into two groups: the aortic AN group and the non-aortic narrowing (NAN) group. We excluded two patients who died. AN was defined as inward stent graft folding at the aortic isthmus of more than 5 mm, confirmed by three-dimensional (3D) axial CT scans (Fig. 1). The length of the aortic isthmus on sagittal and coronal views, the length of the pseudoaneurysm, and the length from the left subclavian artery to the lesion were recorded. The area index was calculated by multiplying the horizontal and vertical diameters of the stenotic region of axial CT by body surface area. The angle of the isthmus was measured using 3D CT images (Fig. 2). The Mann-Whitney U-test was used to compare categorical variables between the two groups. Statistical analyses were performed using IBM SPSS Statistics ver. 19.0 software (IBM Co., Armonk, NY, USA). AN was noted in five patients (31.3%). Among them, blood pressure reversal of upper and lower extremities was noted in two patients (each 20 mmHg and 10 mmHg at systole). No patients complained of lower extremity claudication. The area index in the NAN group (2.16±0.35 cm2/ m2) was larger than that in the AN group (1.74±0.77 cm2/ m2). The diameter of the pseudoaneurysm in the NAN group (31.9±4.2 mm) was smaller than that in the AN group (37.4±7.5 mm). The distance from the subclavian artery in the NAN group (15.7±9.3 mm) was longer than that in the AN group (8.4±3.2 mm). However, not all parameters were statistically significant. The angle of the isthmus in the AN group (107±3 degrees) was smaller than that in the NAN group (131±6 degrees), and this was the only statistically significant difference (P=0.002, Fig. 3). Stent size, aorta diameter, injury severity score, and age were not statistically significant (Table 2). There was no acute endograft aortic collapse after TEVAR. The term ‘hostile neck’ was first used by Dillavou et al. in 2003 to characterize EVAR outcomes in patients with unfavorable aortic neck anatomy of the abdominal aortic aneurysm. Hostile neck refers to an aortic neck angle of more than 60 degrees, a diameter of more than 28 mm, and a length of less than 15 mm. Hostile anatomy of the aortic neck has been associated with poorer outcomes, particularly with a significant increase of proximal endoleaks and graft migration [9,10]. Studies of anatomic factors, such as hostile neck in the thoracic aorta are extremely rare. Muhs et al. 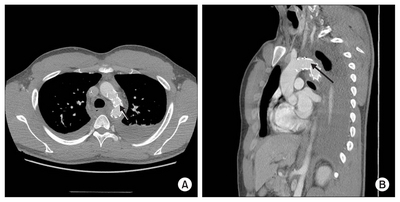 reported acute endograft collapse after Gore TAG treatment of thoracic aortic dissection or traumatic rupture. They reported that aortic collapse was increased in patients with aortic diameters less than 23 mm. Patients with traumatic aortic rupture are mostly young with normal aortas, and the mean diameter in our study was 24 mm. However, there was no aortic collapse in our patients, and this may be due to a technical or material fault from the first-generation stent graft. We reported better operative result and follow-up result of up to 9 years in these series . Peldro et al. 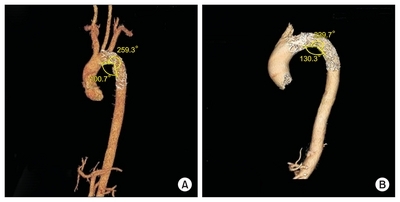 reported aortic anatomy and complications of the proximal sealing zone after endovascular treatment of the thoracic aorta. They concluded that there was a strong association between complications and aortic morphology. Aortic tortuosity was the most important risk factor. Demertzis et al. reported the anatomical features of the aortic arch, such as its steepness and the take-off angles by means of 3D multiplanar reconstruction of thoracic angio-CT scans. There was significant variation of all measured parameters between the subjects. A standard aortic arch does not seem to exist. Most aortic lesions in TTA were less than 1.5 cm from the left subclavian artery. It was about 0.8 cm closer to the left subclavian artery in the AN group. However, there was no statistical significance. The only significant factor was aortic isthmus angulation. All AN occurred in patients with a steep isthmus of less than 110 degrees. The authors’ findings suggest that AN occurs when a stent graft is placed on the neck of an small aortic isthmus, and the stent wire is folded inward by a lesser curvature angle. However, no patients with AN complained of lower extremity claudication. There were two patients whose lower leg blood pressure was 10 mmHg lower than their upper arm blood pressure. However, these patients may have coarctation of aorta. We are regularly monitoring these patients in our outpatient clinic. We recommend all TTA patients with TEVAR should be followed for long time. The limitation of this study is the small number of patients although AN in these patients has not been reported. Aortic isthmus narrowing is thought to be observed in a substantial number of patients although it is not diagnosed correctly because there are not enough symptoms. The advantages of TEVAR are too much to abandon TEVAR in TTA and to choose the open surgery. How do we avoid aortic isthmus narrowing in patients with an acute isthmus angle to treat traumatic aortic transection? Development of a thoracic stent graft that takes isthmus anatomy into consideration is one solution. Traditionally, most thoracic stent grafts are cylindrical. It is thought that making the lengths different according to the position of the lesser curvature and greater curvature can prevent the wire from being folded in. If there are coarctation symptoms, additional stent insertion could be another solution. In conclusion, TEVAR appears to be a good alternative for treating acute TTA. However, AN by stent graft folding should be considered when performing TEVAR for traumatic aortic transection with an acute angle of the isthmus less than 110 degrees. Fig. 1. Aortic narrowing was confirmed by 3-dimensional computed tomography (A: axial view, B: sagittal view). The arrows shows inward folding of the stent graft at the aortic isthmus. Fig. 2. Angle of the isthmus shows the angle between the aortic arch and the descending aorta. a: isthmus upper, b: isthmus lower. Fig. 3. Aortic narrowing (AN) that developed in patients with an isthmus angle of less than 110 degrees. An aortic angle of 100 degrees showing aortic narrowing by inward stent folding at isthmus (A), and an aortic angle of 130 degrees showing good contour (B). Values are presented as mean±standard deviation, number only, or number (%). Values are presented as number (%) or mean±standard deviation. AN, aortic narrowing; NAN, non-aortic narrowing; LSA, left subclavian artery. Azizzadeh, A, Keyhani, K, Miller, CC, Coogan, SM, Safi, HJ, and Estrera, AL (2009). Blunt traumatic aortic injury: inintial experience with endovascular repair. J Vasc Surg. 49, 1403-1408. Di Marco, L, Pcini, D, and Di Bartolomeo, R (2013). Acute traumatic thoracic aortic injury: considerations and reflections on the endovascular aneurysm repair. Aorta (Stamford). 1, 117-122. Parmley, LF, Mattingly, TW, Manion, WC, and Jahnke, EJ (1958). Nonpenerating traumatic injury of the aorta. Circulation. 17, 1086-1101.
von Opell, UO, Dunne, TT, De Groot, MK, and Zilla, P (1994). Traumatic aortic rupture: twenty-year metaanalysis of mortality and risk of paraplegia. Ann Thorac Surg. 58, 585-593. Hartly, MC, Langan, EM, Cull, DL, Taylor, SM, Carsten, CG, and Blackhurst, DW (2009). Evaluation of the diameter of the proximal descending thoracic aorta with age: implications of thoracic aortic stent grafting. Ann Vasc Surg. 23, 639-644. Tynan, D, Alphonse, J, Henry, A, and Welsh, AW (2016). The aortic isthmus: a significant yet underexplored watershed of the fetal circulation. Fetal Diagn Ther. 40, 81-93. Kim, JT, Yoon, YH, Lim, HK, Yang, KW, Baek, WK, and Kim, KH (2011). Thoracic endovascular stent graft repair for aortic aneurysm. Korean J Thoracic Cardiovasc Surg. 44, 148-153. Dillavou, ED, Muluk, SC, Rhee, RY, Tz-eng, E, Woody, JD, and Gupta, N (2003). Does hostile neck anatomy preclude successful endovascular aortic aneurysm repair?. J Vasc Surg. 38, 657-663. Stather, PW, Sayers, RD, Cheah, A, Wild, JB, Bown, MJ, and Choke, E (2012). Outcomes of endovascular aneurysm repair in patients with hostile neck anatomy. Eur J Vasc Endovasc Surg. 44, 556-561. Giménez-Gaibar, A, González-Cañas, E, Solanich-Validaura, T, Herranz-Pinilla, C, Rioja-Artal, S, and Ferraz-Huguet, E (2017). Could preoperative neck anatomy influence follow-up of EVAR?. Ann Vasc Surg. 43, 127-133. Muhs, BE, Balm, R, White, GH, and Verhagen, HJ (2007). Anatomic factors associated with acute endograft collapse after Gore TAG treatment of thoracic aortic dissection or traumatic rupture. J Vasc Surg. 45, 655-661. Peldro, J, Boufi, M, Loundou, AD, Hartung, O, Dona, B, and Vernet, F (2018). Aortic anatomy and complications of the proximal sealing zone after endovascular treatment of the thoracic aorta. Ann Vasc Surg. 48, 141-150. Demertzis, S, Hurni, S, Stalder, M, Gahl, B, Herrmann, G, and Van den Berg, J (2010). Aortic arch morphometry in living humans. J Anat. 217, 588-596.